Is there anything like biting into a fresh homemade dinner roll? I love them warm, soft and dripping in butter – they are truly decadent! But these homemade rolls are a lot easier to make than you might think! 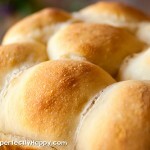 I have a homemade dinner roll recipe for you that you’ll want to make tonight! They are easy enough to a weeknight dinner but tasty enough to serve for holiday gatherings too. 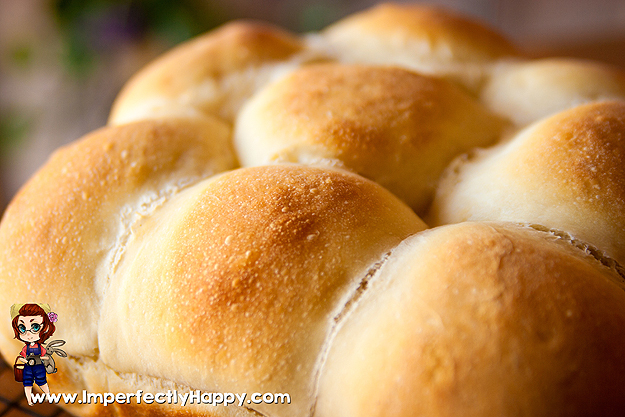 After you try a homemade dinner roll, you’ll never want a store-bought roll again! 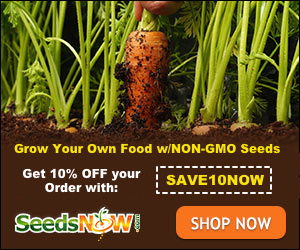 Besides, with GMO wheat invading our food, you’ll know that you’re choosing the best ingredients for your homemade rolls! In a large bowl combine 3/4 cup of the all-purpose flour with yeast packet (undissolved), sugar and salt. On the stove top warm milk, water and butter to about 125 degrees - do not let it boil. Add your warmed liquid ingredients to the flour mixture and beat on medium speed for about 2 minutes. Add the remaining 1/4 cup of all-purpose flour and continue mixing for an additional 2 minutes on high. Continue mixing in flour for 2 minutes at high speed. Add in enough remaining flour to make soft dough. Lightly flour your counter tops for kneading. Knead the dough until the smooth and elastic (about 9 minutes). Cover your bowl and let the dough rest for about 10 minutes. Separate your dough into 12 equal-sized balls. Place into greased 8 inch cast iron skillet or round baking pan. Cover with light towel and place in a warm area to rise for 20 - 30 minutes. Brush with melted butter and serve warm!